J. F. Mergen doubled the square footage of his Baltimore County home, stabilized his energy bills, reduced his family’s carbon footprint, and saved money. J. F. Mergen accomplished the unthinkable: He doubled the square footage of his Baltimore County home, stabilized his energy bills, reduced his family’s carbon footprint, and saved money without sacrificing the Mergen’s quality of life. With the support of two grants from the Maryland Energy Administration (MEA) totaling $5,400, Mergen installed a solar hot water system and a 2.93 kilowatt solar photovoltaic (pv) array. 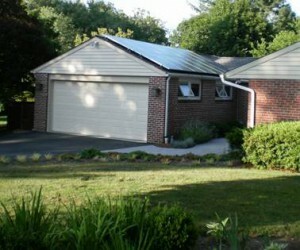 These installations, in addition to a few energy efficiency upgrades, cut his energy bills in half. “The lower cost, lower risk hot water system would be our test drive,” Mergen explained. “It worked. It worked really well.” This inspired Mergen to move ahead with the solar pv grant. To take full advantage of these new systems, Mergen ensured that his new home was as efficient as possible. He installed high-efficiency LED lighting systems, bought ENERGY STAR appliances, and worked with architects to control excess heat from the chimney. A tech enthusiast, Mergen was excited to install a “smart thermostat,” which heats and cools only occupied rooms. With his thermostat, Mergen gathers operational information about his water storage tank, which includes temperature updates. He’s currently implementing other data-monitoring systems as well. “I am in the process of building a set of instrumentation to be able to understand the full dynamics of the [smart thermostat],” he explains. Mergen makes good use of all this data. He uses it to maximize the return on his energy efficiency measures as well as the two solar installations. For instance, he determined that the shade and airflow provided by his rooftop solar panels cool the roof and garage by five-10 degrees. In fact, Mergen’s experimentation has already led to many surprising energy-saving discoveries. Best of all, his solar hot water system will pay for itself a year and a half earlier than expected. Mergen’s grants came from the MEA’s Residential Clean Energy Grant Program, which provides grants to residents who install solar photovoltaic, solar water heating, geothermal heat pump, and wind turbine systems at their residence. Through this program, MEA has helped homeowners save more than $18 million, and reduced the State’s greenhouse gas emissions by 4,200 tons of CO2 – the equivalent of taking 810 cars off the road.